Five Graphic Novel Releases For June. If the list below is anything to go by, it looks like June is a big release month for DC Comics and that will be good news for their fans. As for me, I’m rather intrigued by ‘Bodies’, so I will be aiming to pick up a copy; check back later in the year for my review. Description: Barbara Gordon’s ready for a fresh start. 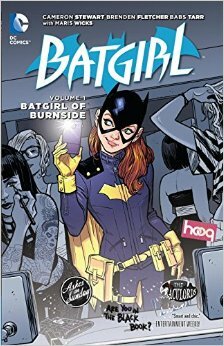 She’s packing her bags, crossing the bridge, and heading to Gotham’s coolest neighborhood: Burnside. And when a freak fire burns up her costume and gear, Babs has the chance to become a whole new Batgirl! Description: LONDON, 1890. As Jack the Ripper stalks the streets, Inspector Edmond Hillinghead-the city’s most diligent detective-applies his skills to an even harder case. The victim is an unidentified male. The killer may have powerful allies. 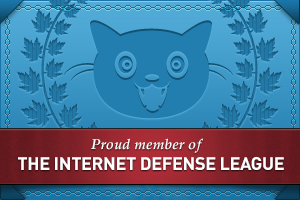 And Edmond’s darkest secret may be exposed if he gets too close to the truth…. 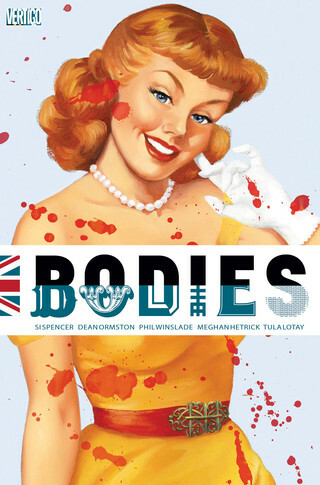 In BODIES, writer Si Spencer teams up with Meghan Hetrick, Dean Ormston, Tula Lotay and Phil Winslade-four incredible artists, one for each era-to slice open the modern murder mystery and uncover the strange secret heart within! 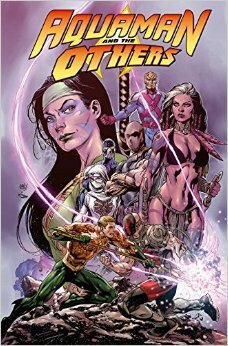 Description: Aquaman and his teammates, The Others, are a mysterious group of outsiders who have put aside past vendettas and personal histories to work together. However, when the secrets of their past are used against them and threaten their lives in the present day, can they keep their tenuous union intact? In facing deadly villains like the KGBeast, the King of Atlantis and his allies may not live to ask that question! Description: Black Canary. Zatanna Zatara. Two of the DC Universe’s brightest stars join forces to combat a deadly new threat-a chilling supernatural foe that preys on their weaknesses and unleashes their awesome powers against each other. A year ago, Black Canary infiltrated a gang of female criminals set to pull a dangerous heist at a Las Vegas casino. Its leader was skilled in hand-to-hand combat and with more than a passing interest in the occult, specifically black magic, one nasty customer. Rather than be taken by Canary or the law, she went to her death, vowing she would get revenge on Canary and her own former gang members. 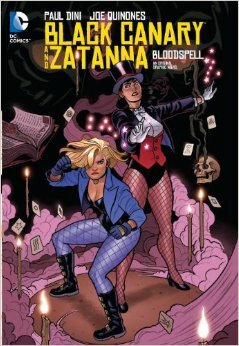 Now, a year to the day later, death stalks those gang members, and Canary must turn to her friend Zatanna to help investigate. Description: She-Ra has the power! One thousand years ago, when Hordak first invaded Eternia, King Grayskull forged the mighty Sword of Power in the very fires of Eternity. The magic weapon defeated the monstrous conqueror, but could do nothing to stop a mutinous overthrow by the King’s closest allies. Though Grayskull had rescued his realm with a blade of peace, his blood was spilled that same night with a crooked blade of betrayal. Now, Hordak’s hordes have returned and seized control of Eternia. 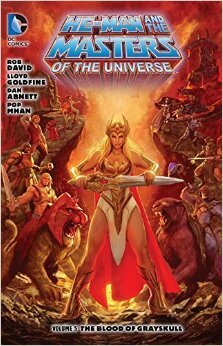 With King Randor dead, He-Man steps forward to lead Eternia back to glory. Newly transcended as the Sorceress, Teela has told him of a secret on the forbidden island of Anwat-Gar that could turn the tide of the war. To retrieve this mysterious advantage, Adam must convince his long-lost sister Adora that she has a place amongst the Masters of the Universe, and the two will have to fight through the perilous Fright Zone… together! Is my novel too graphic for you? At some time or another in our lives, we’ve all read a comic book; be it Marvel or DC Comics, 2000AD or Bunty, at one point we’ve sat engrossed in the artwork and short stories to be found within its pages. So why, as adults do so many people now frown upon that medium we loved as children? Is it because they see them as a childish thing, or something that is read by those unable to cope with a ‘real’ book? To answer this we would first need to know what a graphic novel is and where it fits into society today. Graphic novels are, simply defined, book-length comics, but surely it is much more than that. We only have to look at some of the topics covered within their pages to realize this. Sometimes they tell a single, continuous narrative from first page to last; sometimes they are collections of shorter stories, but always they seem to be a reflection on society at the time is was written and illustrated. They have a tendency to emphasize drama, adventure, character development, striking visuals and politics, rather than the romance or laugh-out-loud comedy found in our childhood reads. It is not a secret that visual parodies, satires, political cartoons, and straightforward funny drawings have been around for centuries, but it took the rise of the newspaper industry in the late nineteenth century to bring comics into everyday American households. From newspaper funny pages rose magazines devoted entirely to comics and superhero stories; from these magazines rose book-length collections of previously published comics, and from some of these rose movies that grossed large amounts of money at the box office. 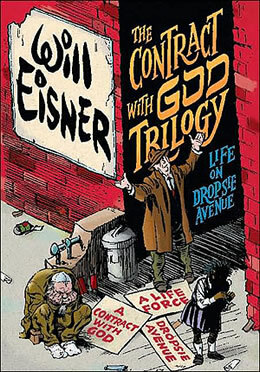 However, most comics historians agree that the first real graphic novel was Will Eisner’s A Contract With God and Other Tenement Stories published in 1978. Decidedly adult in its images, themes, and language, Eisner’s book spoke to the generation that had first grown up with superhero comics in the 1940s and 1950s. It should also be noted that, despite the signature telling our brain otherwise, Will Eisner had no connection with Disney. The only connection is that both men routinely drew with brushes, so they both have a brush-like style to their signatures. Not every reader snubs the graphic novel though, and because of those who regard them as a guilty pleasure (myself included), the popularity of graphic novels is growing as more people become familiar with works in this appealing and diverse format. This is good news, as a thriving market for graphic novels and rich cross-cultural influences mean that more experimental, innovative, high-quality stories and art are available now than ever before. Readers, both acquainted with the graphic novel and those who are just discovering it, have a wide variety to choose from, so readership is no longer limited to fans of superhero escapades or slapstick humour, which is a good thing right? In addition, greater access to graphic novels—such as graphic novel collections in public, college and school libraries—certainly contributes to their current popularity. Like every medium though, there will always be an Underground aspect. In the graphic novel world, comix artists like Harvey Pekar and R. Crumb inspired the early graphic novelists. (Comix, by the way, is an alternate spelling of comics that deliberately differentiated these artists from the respectable, Comics Code-obeying, mainstream comic books.) Many later graphic novel writers and artists got their start at places like Marvel and DC Comics drawing and writing superheroes like The Fantastic Four and X-Men. Comics writer Stephen Weiner considers Art Spiegelman’s Maus (1986), Alan Moore’s Watchmen (1986), Frank Miller’s Batman: The Dark Knight Returns (1986), and Neil Gaiman’s Sandman (1990) to be among the 100 great graphic novels public libraries should consider constantly having on their shelves. My personal favourite is Alan Moore and David Lloyd’s V for Vendetta (1982), and a hardcover copy of which I proudly own. Reading back through this, I don’t think I actually answered any of the questions I posed at the beginning, well in my mind I don’t think I have. 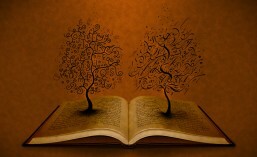 Maybe this, like everything else we read, is subject to taste and what is one man trash is anothers treasure. I, personally, like to be made to question my world sometimes when I read, and if it means I pick up a graphic novel as opposed to another type of book, to get the grey cells moving then I will. Ultimately though, like the adult the world sees that needs to be nourished, my inner child needs to be fed too; after all she is the one that stokes the fires of my imagination and dreams.